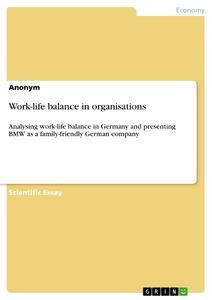 The following paper describes the work-life balance movement in Germany and the work-life balance policies of the German car and motorcycle producer BMW. First, work-life balance (WLB) will be defined and the importance of leisure for WLB will be briefly explained. Next, the paper will provide information about leisure in Germany and explain some reasons for the German WLB movement. By describing the WLB policies of BMW, the paper will examine the influence organisations can have on their employees’ WLB and the reasons organisations have to introduce WLB programmes. The paper will argue that WLB policies provided by organisations need to be managed professionally to result in a win-win situation. For the satisfaction of these segments, leisure is essential. Haworth and Veal (2004, p. 1) define leisure as “time which is not occupied by paid work, unpaid work or personal chores” and argue that well-being and enjoyment are important leisure characteristics. Leisure is the key for a sane WLB, as explained with the example of the health segment: Enough free time avoids time pressure which “contributes to higher levels of stress” which “contributes to mental health disorders ... and other health problems“ (Zuzanek, 2004, p. 133). Furthermore, participation in leisure activities reduces anxiety and depression (Haworth, 2004) and Iso-Ahola and Mannell (2004) argue that leisure prevents the risk of burnout. Leisure time and activities in Germany and the German WLB movement will be presented in the following. Figure 2 illustrates the percentage of leisure time – 24 hours minus time spent on paid and unpaid work and personal care – in an average day within 18 selected OECD countries. With 27.4 percent (approximately 6.5 hours) Germans have the second most leisure time. Australians, for comparison, reach only 22.5 percent (approximately 5.5 hours). The high leisure time in Germany is related to the fact that “Germany is among those countries with the shortest contractual work times” (BMW Group, 2002, p. 2). According to Alberto, Glaeser and Sacerdote (2005), Germany’s average working hours per person per week account for only 18.7. Moreover, German employees annually have the right for 24 paid leave days (Bundesministerium der Justiz, n.d.). According to Statistisches Bundesamt (2008), Germans spend 11 percent of their consumption expenditure on leisure, which accounts for €218 a month. Figure 3 provides an overview of leisure activities and participation in Germany.